Call the carb police, because I’m celebrating TOAST. I know it’s common knowledge that white bread isn’t good for our diet, but choosing the right wholegrain loaf makes it ok for us to enjoy some yummy toasty snacks on occasion. Besides, life is all about balance right? I don’t eat bread every day, so when I do, I’m going to enjoy it for sure! First let’s address our loaf! When choosing your wholegrain loaf, make sure it has at least 2g fibre, is low in sugar (under 4g) and has 3 or more grams of protein with 0g of saturated fat. We’re lucky that here in the UK, we can spot most of these things by the traffic light system on the pack – look for green! I’m loving Hovis Seed Sensations Chia Bread at the moment! Here comes the Toast-spiration – my top 5 healthy and yummy toast toppings. Like a party for your taste buds! I love sweet and savoury together… Just make sure you keep it as natural as possible! I’ve used Meridan Blueberry Jam, and Meridan Smooth Peanut butter. So. Good! You all saw it coming… because I LOVE avocados! Sprinkle with pepper and add to Brunch! 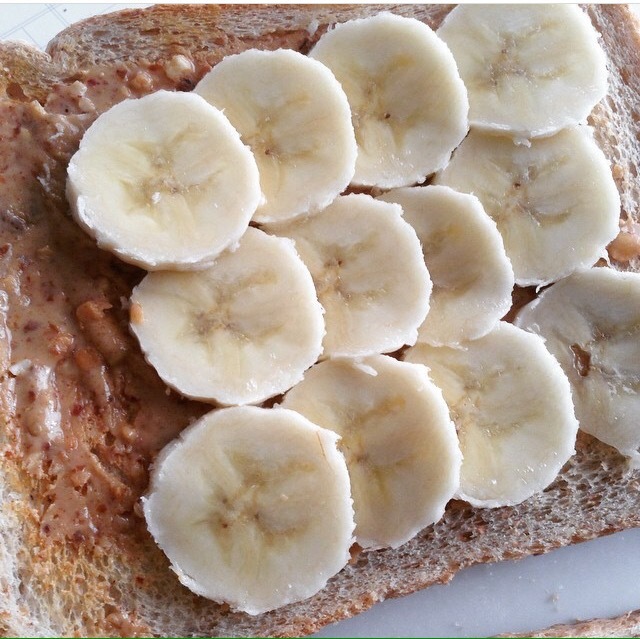 Peanut butter is just my favourite in general… and bananas go so well! One slice of this treat fuels me before a workout.